The 'discovery' of Piltdown Man was a famous hoax in the history of the science of archaeology. Following on from the unearthing of the fragmented skull remains in Piltdown quarry in Sussex, England, between 1908-1912 of what had apparently been a type of primitive hominid species increasingly ambitious claims of the finding of a missing link fossil relevant to understanding human evolution were made - partly through the intervention of the popular press. Although the fossil remains presented as being discovered in Piltdown Quarry subsequently seemed to display features that did not fit in with other paleontological discoveries of hominid fossil remains it was only some forty years later that 'Piltdown Man' was proven to be a fraud. 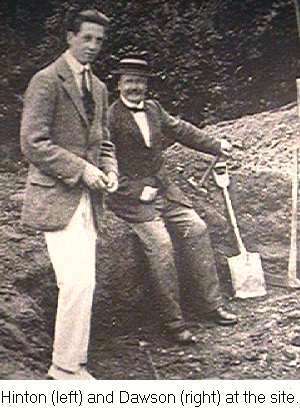 The excavations of 1912 were undertaken by Charles Dawson and the 'early hominid' type he discovered was given the scientific name Eoanthropus Dawsoni before many months had passed. The remains seemed to combine a skull capable of housing a large brain with a jaw structure that was judged to be fairly primitive. Other significant skull remains were also reported as being discovered in 1915 bring the total of the 'Eoanthropus' finds made at Piltdown Quarry to two skulls, a canine tooth, a mandible (lower jaw), together with a tool carved from an elephant tusk. At this time the whole subject of Human Evolution and the interpretation of fossil remains was relatively new and undeniably controversial. Darwin's 'Origin of Species' had been published in 1859, his 'Descent of Man' followed in 1871. Very limited early discoveries of Hominid type fossils had been made of what became known as Neanderthal Man (1856), Cro Magnon Man (1869), Java Man (1890), Peking Man (a molar tooth 1903), and Heidelberg Man (1907). Society as a whole, however, was a long way from reaching a consensus on the relevance of theological versus scientific claims about the origins of humanity. The scant quantity of hominid type fossils available to paleontology were also hard to classify and problematic to give date of origin to. The Piltdown discoveries were initially dismissed by some scientists as they held that the skull fragments were self evidently from a different species than the jaw fragments but an acceptance of the claims of 'Piltdown Man' to be seen as something of a missing link in human evolution did take hold of the popular imagination. Other paleontological discoveries continued to be made, however, such as Australopithecus (1924), and a Peking Man skull (1929), that bore features inconsistent with the claims being made for the Piltdown discoveries. Furthermore a Fluorine Content Test had become accepted as being able to yield a reliable date for such discovered remains. When a Fluorine test was conducted in 1949 on the Piltdown remains the results indicated a relatively recent origin. Geologists began to cast doubt on the accepted age of the gravel deposits in the Piltdown Quarry in which the 'finds' were supposed to have been made. The case for Piltdown Man had been increasingly dismissed by academic paleontology. Some authorities declared the Piltdown remains to be a mixture drawn from hominid and other sources, scientific papers and textbooks tended to downplay or actually omit reference to Piltdown Man. Finally, in 1953, Piltdown Man was established as being a deliberate hoax, this came about during an international conference of paleontologists in London where a range of fossil remains were on display and where the suspicions of some of the delegates were aroused by the pattern of wear evident on the Piltdown teeth. Microscopic examination showed evidence of deliberate filing such that the molar teeth would seem to be a close and natural match for the skulls. This and other anomalies resulted in Piltdown Man being declared to be a deliberate hoax. There was uncertainty, however, as to who had decided to pull off the fraud. In the aftermath of the final discrediting of the Piltdown claims extensive scientific tests established that the Piltdown skulls were of Medieval origin and were perhaps 620 years old, the jawbone, itself perhaps 500 years old, probably came from an Orangutan, and the canine tooth was a genuine, chimpanzee, fossil dating from the Pleistocene Age. Evidence of deliberate staining with an iron solution to give an appearance of age to the bones was also detected.